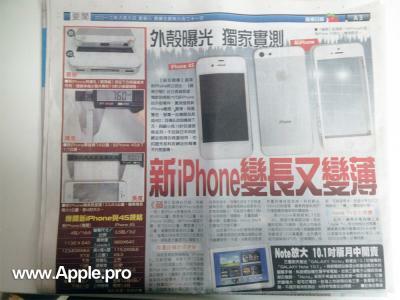 Apple.pro posts scans of a story that first appeared in Chinese-language newspaper Apple Daily. That publication obtained one of the many "iPhone 5" enclosures that have been available over the past few weeks and took measurements of them. 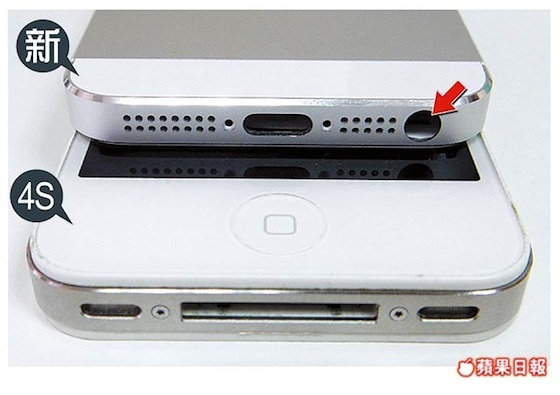 The iPhone 4S measures 9.3mm in depth, so a 7.6mm thin phone would represent an 18% reduction in thickness. The width of the new iPhone is expected to be about the same as the iPhone 4S, but the height will increase in order to fit a 4" diagonal screen. Apple is expected to introduce the new iPhone at a September 12th media event. Update: Apple Daily's online version of the article is now available with higher-quality images. Apple Daily's sister publication Sharp Daily has also published photos and a video showing their measurements of the casing. I really hope the next iPhone is the same thickness and just has a larger battery. 2011 - "I WANT A 4" SCREEN! I WANT A 4" SCREEN ELSE I'M SWITCHING TO ANDROID!!!" 2012 - 4" iPhone rumors appear "NOOOOOOOOOOOOOOOOO ITS HORRIBLE, NOOOOOOO I DON'T WANT IT"
Then don't read a rumors website. So sure..... just like the case designers were so sure the last new iPhone was going to have a tapered design. Did an Apple engineer leave this in a Chinese bar or what? I am very excited for this iPhone. Although there is a lot of hate, I feel as though this will be a revolutionary phone. The design looks modern and up to date, and still has a 4/4S feel. I will be purchasing on day one for sure. Well, I kinda like the design. It really grew on me the more I looked at it. I think there is no doubt that this will be the new iPhone. I also believe they just call it 'iPhone' instead of iPhone 5. 4" just because it's bigger, doesn't sound like Apple. There must be a very good reason they made it bigger, especially since Steve Jobs was very involved with the iPhone 5 (according to various articles). Maybe they've added something in iOS6 that makes the extra space more usefull in a innovative way? Who knows..